"First of all, we need to say that Puigdemont was arrested at the direction of the minister. They knew that he [Puigdemont] was in Finland and he had to leave by car, because if he had gone by plane he'd have been arrested right there. They were in Germany as they were following him and they thought it would be easier to arrest him in Germany and get him to Spain. And what's happening now is a fierce attempt to put on trial the leaders of all Catalan pro-independence parties. However, eventually, all their attempts will backfire as there will be an international line of battle, which they wanted to keep only between Spain and Catalonia," Surra said. "If they agree the political issue should be settled in court, as the accusations against Puigdemont and others are false. Because there has never been any outbreak. That's why I think it'll backfire on the Spanish Government and it'll work for our benefit," the representative added. "300 police officers have been sent to the protests in order to join the crowds. Moreover, Mossos d'Esquadra was ordered to beat the demonstrators, to beat their own people" Ana Surra emphasized. In conclusion, she said: "Firstly, we showed that there has never been any violence on our part. It's emerging right now as they're planting their people. Secondly, the vice-president makes use of this chaos to continue charging and suppressing our independent channels that keep us updated on what's going on." 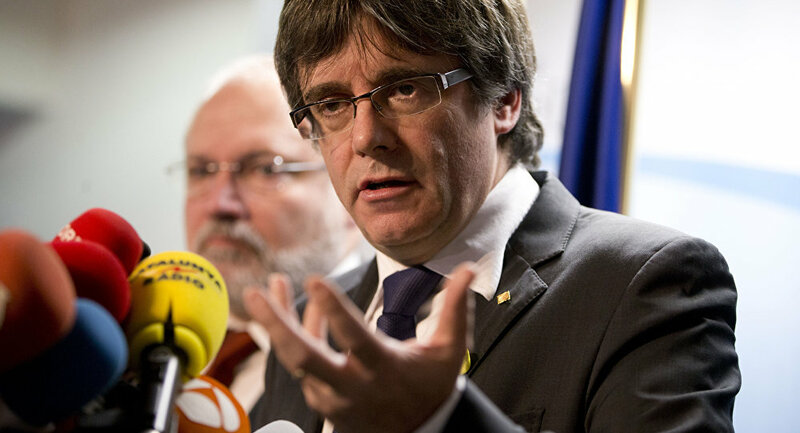 On Sunday, Puigdemont, who is wanted in Spain for sedition and rebellion, was detained on a European arrest warrant in Germany while on his way to Belgium. It followed a Friday decision by Spanish Supreme Court Judge Pablo Llarena, who had activated a European arrest warrant for a number of Catalan politicians. This included Puigdemont, who was away in Finland at the time but had left for Belgium shortly thereafter. Puigdemont's arrest sparked protests across Catalonia, with about 50,000 people taking to the streets to show their support for their former leader. On October 1, Catalonia held an independence referendum, which the central authorities did not recognize. After the regional parliament unilaterally announced independence later in October based on the results of the vote, Madrid imposed direct rule over the autonomous region, dissolved the Catalan parliament and called a snap election. Several pro-independence leaders were jailed, while Puigdemont fled to Belgium to avoid arrest. In November, a Spanish court issued a European Arrest Warrant for Puigdemont and several other former members of the Catalan government. The following month, however, Spain dropped the warrant, saying that the former Catalan president appeared willing to return. The views and opinions expressed by Ana Surra are those of the expert and do not necessarily reflect those of Sputnik.